What is the intermittent syndrome? Apparently it’s caused by erratic electronic signals sent from the air-flow-meter ( AFM ) to the electronic control unit ( ECU ), causing the ecu to shut down or go into default. It goes like this: You are on a longer trip, the wasserboxer has been humming along for several hours and runs really good. Then all of a sudden, out-of-the-blue, the engine cuts out. The vanagon lurches, looses power, and starts bucking. You pull over and shut it off. A little later, you restart the motor, and it runs just fine. Sometimes this might not happen again for a long time, or if you are not so lucky, the vanagon might start this syndrome all over again after only a few minutes of driving. Sometimes the cutting out is very slight, barely noticeable. My ‘90 westy did this on our last trip in Death Valley, and once before on a previous trip. There can be many possible causes for temperamental vanagon behavior: corroded grounds, defective wiring harness, worn air flow meter, vacuum leak, bad spark plug wires, loose contact by the fuel pump, bad fuel pump relay, defective ECU. (I’m sure I forgot a few.) When you checked or replaced all those gizmos, and the vanagon continues to exhibit the intermittent syndrome, you can try the following. The Volkswagen dealer sells a short wire harness, especially designed to cure this intermittent vanagon behavior. The harness is installed between the AFM and the existing cable. The price for the VW dealer harness is around $166. 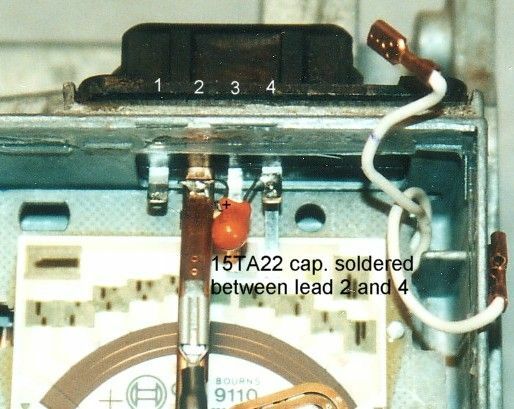 The less costly, but as effective solution, is to solder a tantalum capacitor between terminals 2 and 4 in the cable connecting the airflow meter. 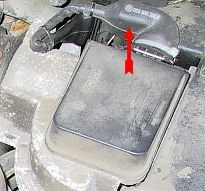 Some vanagon owners installed the capacitor under the rubber boot that protects the plug on the AFM. I decided for different reasons to install the capacitor inside the air-flow-meter on my ‘90 vanagon. The "syndrome" has not reappeared since this fix. I used a 15 volt 22 microfarrad tantalum capacitor.Part Nr. 15 TA 22 cap price $2.80 You can also use a 25 volt 22 microfarrad capacitor, if available. These are commonly available at electronic supply stores. Don’t use a less expensive electrolytic capacitor. Apparently the capacitor helps to even out the signal, to prevent the ECU from going into “default mode”. Sounds simple enough. The two ground wires (white) removed and the capacitor soldered to the leads going to connectors 2 and 4 on the wiring harness. The plus (+) of the capacitor is soldered to 2, and the minus (-) side of the capacitor is soldered to 4. Make sure to mark the position of the two wires before removing, so they don’t get mixed up.